This town knows Aaron Cromie, polymath of the arts—puppeteer, performer, director, designer of puppets, sets, and props; choreographer, musician, teacher, and writer. What else? I know there’s even more. So before the show at Studio X it was surprising to see Aaron Cromie bustling about with lowly house duties, bringing in the extra chairs and managing the doors. Doesn’t every theater have that special dressing room for people like him, stocked with good whiskey, with a star on the door? Disclosure: I had to see SAINT JOAN BETRAYED. It’s personal. I read The Story of Joan of Arc by Jeannette Covert Nolan when I was ten. Joan, the Maid of Orleans, jumped to the top of my heroine list. In a prologue Cromie provides voices for paper cutouts who reside in a little toy cardboard theater. We learn of the court, where a tiny paper Elvis plays the King, “Thank you. Thank you very much.” A history of the two saints and the archangel who spoke to Joan is given. An old suitcase outfitted with a file-type display provides a lurid picture of Satan in hell. Cromie comments on the picture: “Satan went to hell…. You like that? Fractals.” When the helpful and amusing introduction is over, Cromie disappears and Saint Joan rushes in bearing two old suitcases, and speaking French. Mary Tuomanen, luminous and ethereal, makes a great saint. A peasant with no military experience, Joan begins her personal campaign to be allowed to go to battle to seat the Dauphin for France. Mary steps outside the role to comment on the character, “Nothing but purity in those illiterate eyes. We prefer her to be literate, don’t we?” It’s a wonderful script, intelligent and shot through with humor. Saint Joan speaks French and the smart-mouth Dauphin puppet (which Mary masterfully manipulates) speaks English. He says Joan is “a total morale boost… I dig it Joan.” With her puppets and toys Tuomanen acts out the bishop, soldier, general, and the big horseback-led campaigns. In the end, no one backs Joan up, least of all her own church. And in a small theatrical moment that illuminates her end, she is over. Complete economy of movement marks Mary Tuomanen’s every action. All this drama and virtuoso entertainment in 45 minutes. Utterly remarkable. 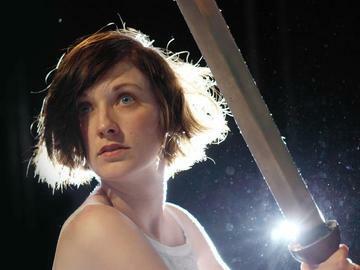 [Studio X] September 5-14. fringearts.ticketleap.com/saint-joan-betrayed. I will NOT get distracted by anything­­ — not any of my hobbies, or my sleep deprivation, or this tasty looking banana. What is this banana doing here anyway?